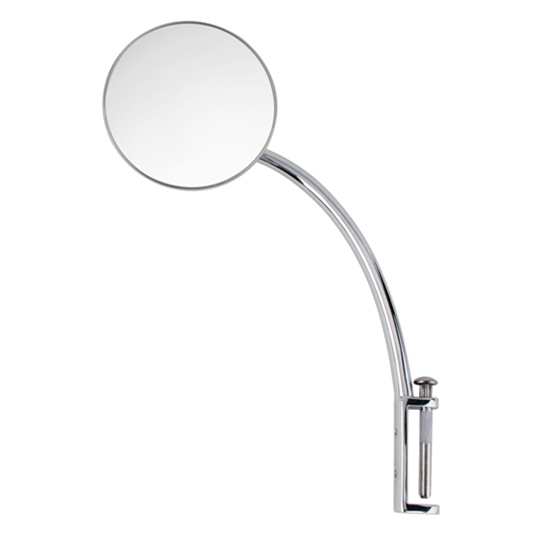 Stainless steel mirror with chrome plated zinc arm. Pin diameter is .276" and knurled at the top. All mirror heads are Stainless Steel. Arms are die cast and chrome plated and work on either the left or right side. Hinge pins are included. Fits 2-1/4" hinge. Pin diameter is .276 and knurled at the top for a tap in application. Fits 1935-1940 Ford passenger cars and 1948-1952 Ford pickups. Sold each. Center of hinge pin to outside edge of mirror is 8"
Center of hinge pin to hinge pin bracket is 3/4"